The contribution of abolitionist constitutionalism to the original public meaning of Section One of the Fourteenth Amendment was long obscured by a revisionist history that marginalized abolitionism, the “radical” Republicans, and their effort to establish democracy over Southern terrorism during Reconstruction. As a result, more Americans know about “carpetbaggers” than they do the framers of the Fourteenth Amendment. Although this cloud began to lift with the work of Jacobus tenBroek, Eric Foner, and William Wiecek, knowledge of abolitionist constitutionalism among constitutional scholars was all but snuffed out by the dismissive writings of William Nelson and Robert Cover. The more one reads these forgotten abolitionist writings, the better their arguments look when compared with the opinions of the antebellum Supreme Court. But even if the Taney Court was right and the abolitionists wrong about the original meaning of the Constitution, the Thirteenth and Fourteenth Amendments were enacted to reverse the Court’s rulings. Where rights are infringed, where fundamental principles are overthrown, where the general system of the laws is departed from, the legislative intention must be expressed with irresistible clearness, to induce a court of justice to suppose a design to effect such objects. I recently purchased a copy of Volume I of the early criminal law treatise, William Hawkins, A Treatise of Pleas of the Crown; or, a system of the principal matters relating to that subject, digested under proper heads. At common law, non-misdemeanor English crimes were the causes of action brought in the King’s court — thus a treatise on pleas of the Crown was a treatise on major crimes. The Hawkins treatise was first published in 1716, and it is one of the handful of sources regularly used to understand the common law of crimes (together with Volume 4 of Blackstone’s Commentaries, the Third Part of Coke’s Institutes, and Hale’s Pleas of the Crown). The copy I purchased is a 6th edition as reworked by Thomas Leach and published in Dublin in 1788. My understanding is that the Dublin editions were pirated: They were published in Dublin to get around English copyright law. Pirated or not, I found this one on the cheap. Nice original copies of Hawkins seem to run around $700 to $1,000, but I found this for only $30 (albeit just the 1st of two volumes, and in need of rebinding). Your favor of the 25th ult, is received. The case of Sam R. Curtis et. 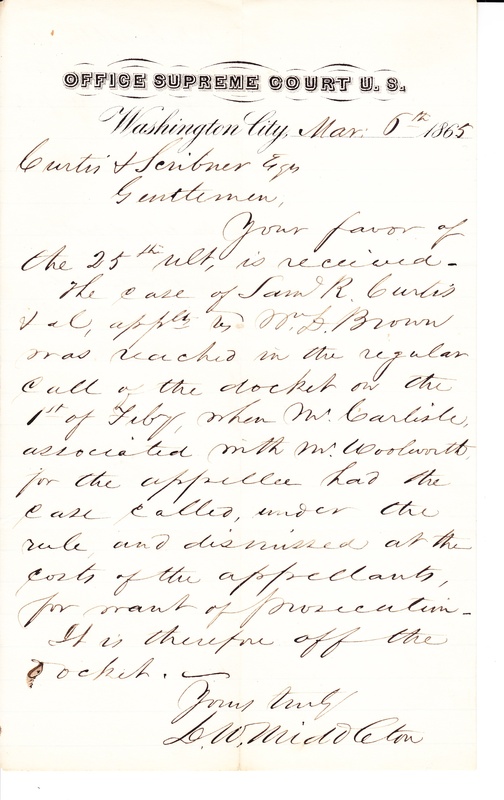 al., applnts v. Mr. D. Brown was reached in the regular call of the docket on the 1st of February, when Mr. Carlisle associated with Mr. Woolworth, for the appellee had the case called under the rule, and dismissed at the costs of the appellents, for want of prosecution. It is therefore off the docket. In this letter, the court clerk responds to a law firm’s inquiry about a case. Specifically, the letter informs the firm that the case was dismissed when the appellants’ lawyers didn’t show up in court. The law firm had inquired about the case in a letter dated February 25th — “25th ult,” shorthand for 25th ultimo, or the 25th day of the previous month. But what was the case about, and who were the people named in the letter? I did some hunting around, and here’s what I could figure out. The author of the letter is easily identified: D.W. Middleton was the Clerk of the Supreme Court from 1863 to 1880. The named appellant, “Sam R. Curtis,” was Major General Samuel Ryan Curtis, a Union general who months earlier had led his troops to a decisive victory over the Confederates in The Battle of Westport. The law firm of Curtis & Scribner was an Ohio law firm, and the “Curtis” in the firm name referred General Curtis’s older brother Henry Barnes Curtis, a very prominent Ohio attorney.